Why are new TB drugs needed? Drugs with few drug drug interactions, so they can be safely provided for people with HIV. https://en.wikipedia.org/wiki/Phases_of_clinical_research Those drugs going through a phase 3 trial are the closest to being made available for general use, provided of course that the phase 3 trial is successful. A phase three trial for any drug takes a long time. A phase 3 trial for a TB drug requires a lengthy TB drug treatment period. This has to then be followed by a one to two year period of patient follow up to determine treatment failure and relapse. Only then is the effectiveness of the TB drug known. In any TB drug trial the proposed new TB drug must not be taken on its own. It must be taken with at least two other existing TB drugs or with other new TB drugs. 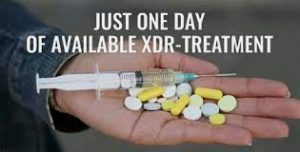 The Nix-TB trial is the first TB clinical trial to test a new drug combination which has the possibility of being a shorter, all oral, and affordable treatment for XDR-TB. This combination does not require injections and has far fewer pills. The Nix-TB drug combination is pretomanid, bedaquiline and linezolid. This drug combination is predicted to be able to cure XDR-TB in six to nine months. In February 2017 the results became available for the first 72 people to be treated in the study. Thirty one people had completed treatment and 6 months of post treatment follow up. Of these 31 people, 29 people cleared XDR-TB. This means that TB bacteria could no longer be cultured from their sputum. Twenty people stopped taking the drug after six months of follow up and only one relapsed. A drugs “pipeline” in drug development terms, refers to all the drugs at different stages of development. It also shows how the drugs are progressing down the “pipeline” through the various clinical trial stages etc. At the point at which they exit the “pipeline” they are available for general use. Bedaquiline is the active substance in the new TB drug Sirturo. Sirturo is available for the treatment of drug resistant TB, when there are an insufficient numbers of other TB drugs available. There is much more about bedaquiline. www.tbonline.info/ There is much more about delamanid. PA-824 is another nitroimidazo-oxazole currently being developed by the TB Alliance. It also can potentially be used for the treatment of both drug sensitive and drug resistant TB, and it has also shown activity against both latent and active TB. www.news-medical.net/news/20121212/AstraZeneca-Case-Western-Reserve-initiate-AZD5847-Phase-2a-trial-in-TB The study is sponsored by the National Institute of Allergy and Infectious Diseases (NIAID), which is part of the U.S. National Institutes of Health. Several members of the fluoroquinoles class of drugs are currently already used as second line TB drugs for the treatment of multi drug resistant TB. However, the older drugs such as ofloxacin and levofloxacin are often used rather than the newer fluoroquinolones moxifloxacin and gatifloxacin. Moxifloxacin and gatifloxacin are currently being developed for the treatment of drug sensitive TB. Each of these potential TB drugs is currently undergoing evaluation in a phase 3 trial, to see how effective it is when substituted for either ethambutol or isoniazid, to shorten the treatment of drug sensitive TB from the standard six months to four months. The gatifloxacin trial is being conducted by the Oflotub Consortium and moxifloxacin is being developed by Bayer and the TB Alliance. What is ideally needed is not just one new TB drug but several which can be used together. In July 2012 it was announced that a phase 2A study had been carried out investigating a number of drug combinations including PA-824 over a 14 day period to assess their suitability for further development. The combination of PA-824 moxifloxacin and pyrazinamide had the greatest early bactericidal activity (EBA). One advantage of this drug combination is that it does not involve either isoniazid or rifampicin. It is therefore suitable for use with patients who are resistant to these drugs. A regimen without rifampicin would greatly simplify the provision of TB treatment alongside HIV antiretroviral therapy.